It felt like an odyssey imbued with divine inspiration, magnitude and benefit. During the worst New Zealand drought in 65 years, Ven. 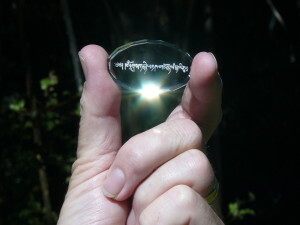 Tenzin Chogkyi, Brian Rae and I offered holy crystals to bless the waters of New Zealand’s North Island this year. From the guidance received, we felt like instruments of the guru-buddhas’ compassionate activity. Lama Zopa Rinpoche commissioned a Padmasambhava crystal to help bless water, March 2013. Photo courtesy of Murray Wright. To benefit people in Bodhgaya, Lama Zopa Rinpoche commissioned glass crystals engraved with a special mantra of Guru Padmasambhava. Due to Padmasambhava’s stainless prayers impregnated with bodhichitta and wisdom, the minds of those drinking water touched by the mantra are blessed. Veteran stupa builder Tom Waggoner brought the crystals when he visited in 2011. We offered them into several large reservoirs around Auckland. An enthusiast of holy objects he said, “Wow, it’s so easy to create merit with these crystals. All you have to do is place them in the water!” He urged me to “get some inventory” from the FPMT Foundation Store to offer more. In February, Brian and I had a powerful experience on an extremely hot day doing just that. As we approached our third site, Brian felt a migraine coming. These headaches, which had dogged him since youth, begin with blurred vision. At the dam-site, when launched towards the water, the crystal struck a barrier and shattered on rocks below. Dejected, we offered the shards in the water. Returning with another, we chanted the crystal’s mantra while marching 400 meters [1,312 feet] from the car up to the dam. At the top, Brian’s vision became extremely clear – crystal clear – and the headache never materialized. Unusually-shaped clouds were seen. Ven. 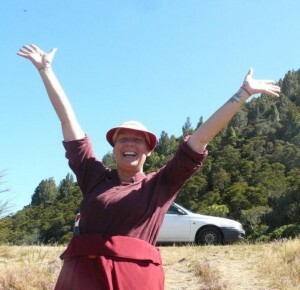 Tenzin Chogkyi rejoices in offering Padmasambhava crystal to New Zealand’s waters, March 2013. Photo courtesy of Murray Wright. After recounting the story to Ven. Tenzin Chogkyi at Mahamudra Centre and sharing our plans to offer crystals in Lake Taupo and the Waikato River, she burst out, “Take me with you!” Thus the idea for our holy road trip in March was born. The Waikato is not just any river. It’s the longest in New Zealand and has spiritual significance for indigenous Māori tribes. On its 425-kilometer [264-mile] passage to the Tasman Sea, it powers turbines at eight dams producing 13 percent of the country’s electricity, provides water for cities including Auckland, nourishes farms, and is used for white-water kayaking, water skiing and world-class rowing. While driving south from Auckland we discussed whether Māori would approve our plans. We stopped to ask the late Māori Queen, Te Atairangikaahu, buried high on Taupiri Mountain beside the Waikato. Even though there was a real sense of approval, it suddenly became clear we should seek permission from the local guardians as is done in the Tibetan tradition before building a house or starting a retreat. Serpentine water beings called nagas are said to be the guardians of waterways. Interestingly enough, Māori believe in taniwha, protective guardians of people and places. Sounded a lot like nagas to us! Our focus then turned to Uenuku, rainbow god and bringer of plentiful resources. This powerful landlord spirit led the original Māori canoes from Hawaiiki to New Zealand 800 years ago. His abode is a striking wooden carving in Te Awamutu museum 80 kilometers [50 miles] south of Taupiri. After offering a fresh willow branch and request to him, we truly felt local approval. North Island is shaped like a stingray. In Māori legend it is known as the Fish of Maui, a demi-god who pulled it from the sea-bed. Lake Taupo, New Zealand’s biggest lake, was formed during the world’s largest known eruption in 70,000 years. This legendary “heart of the fish” was our next stop. 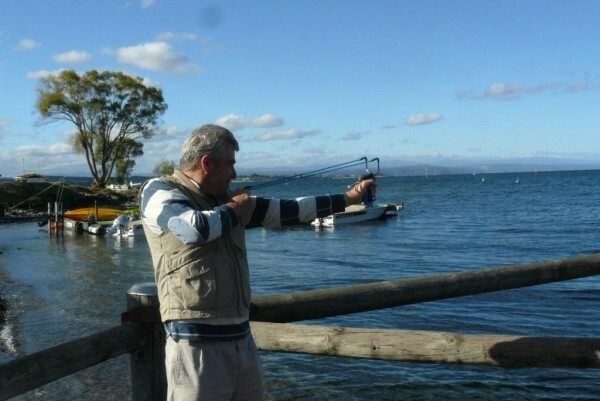 Murray Wright uses a slingshot to offer the Padmasambhava crystal to Lake Taupo, New Zealand, March 2013. Photo courtesy of Murray Wright. On the lake shore the idea of using a catapult to propel our sacred missiles arose. A sporting shop supplied the weapon, now transformed into “the holy slingshot.” It worked a treat, launching the crystal, spiraling and sparkling in the sunlight, far out into the lake. While chanting, Ven. Tenzin spotted an error in the mantra transliteration so we invoked the assistance of modern technology and FPMT International Office’s Tom Truty [director of Education Services]. The pilgrimage had gone international! His reply didn’t reach us in time for the second crystal (we covered ourselves by reciting both versions), and it was a few hours and a 200-kilometer [124-mile] circumambulation of the now holy lake before we got to the third location. Again we were guided by unseen hands. After taking a road not intended, a flock of black swans was seen gliding high above Lake Karapiro, a large dam and recreational lake on the Waikato River. Marveling at the beauty of these birds, Ven. Tenzin said that she had never seen swans so high in the sky before. Suddenly we saw a sign pointing to a recreational reserve. Unbelievably there was mobile phone signal in this remote and stunning location, and sure enough Tom had replied. Having checked the original mantra written by Lama Zopa Rinpoche he confirmed the transliteration error. Inspired, we now chanted the correct holy mantra: OM SHA SAHABHI YATA SHA AMOGHA SAMBAHALITU. From left to right: Murray Wright, Brian Rae, and Ven. 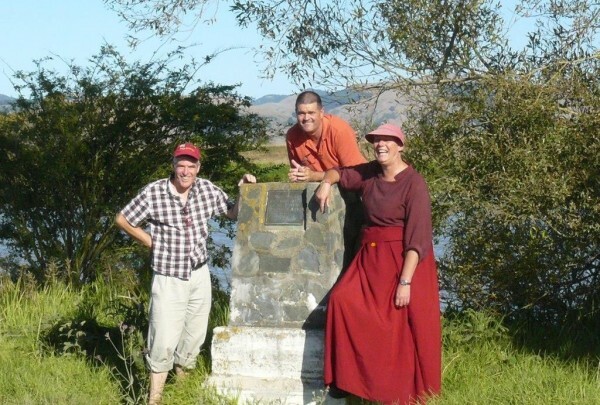 Tenzin Chogkyi at the site where Captain James Cook landed on the Waihou River in 1769, New Zealand, March 2013. Photo courtesy of Murray Wright. Our last destination was where Captain Cook (New Zealands’s equivalent of Christopher Columbus) sought fresh water on the Waihou River 250 years earlier near where it empties out into the vast Pacific Ocean. As we completed our final dedications the tide was flowing in and nearly full, which seemed like a good omen. We had been guided and blessed on our journey of love. May the blessing ripples from the crystals and the echoes of the mantra continuously reverberate around the planet bringing all beings both temporal and ultimate happiness! Murray Wright has been a student for 35 years and has served FPMT in various capacities, including as spiritual program coordinator at Vajrayana Institute, Chenrezig Institute and FPMT International Office; and as director of Land of Medicine Buddha in Soquel, California. The Padmasambhava crystals are available through the FPMT Foundation Store.